Midnight Patisserie blend trad-folk, bal-folk and jazz to create Fresh Prog Folk served hot. 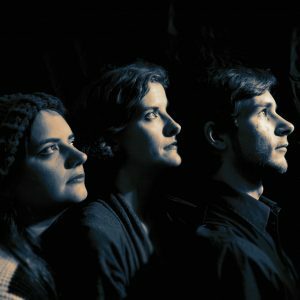 Old friends knead something completely new from their voices, accordion, harp, glockenspiel, drums, and guitar: the musical spices of Tom Evans, Katy Coope and Steph West. They share a love of rich songs, lively mouth-music and big soundscapes. With the aid of strange gadgetry, and a wide range of influences, they create their own magical music. Bring sunglasses and oven mitts. Tom has an enduring love of noise making. The favourite for the last 8 or so years has been Piano Accordion but other sonic competitors still jostle for attention, with piano and guitar as the current leaders. Tom always has several projects on the go and is often found surrounded by tools or components, repairing free reed instruments, recording sounds (mostly musical), or inventing solutions to everyday problems (having a particular knack for string operated curtains). Katy sings, composes and occasionally hits things with things. Her influences range from Britain across Eastern and Western Europe, America and Japan, from trad to swing to chiptune. She’s a vocalist with internet music collective HarmonicBlend and also is an avid lindyhopper. She loves big crunchy harmonies, linguistic shenanigans, and mashing together genres both old and new. She also wears an unreasonable number of both literal and metaphorical hats. Steph is carving a niche as one of the few harpists to play English trad. She loves traditional music from all over the world and the vitality of music created to dance. Blessed with slightly strange hands, Steph started using her unique harp textures in her songs. These same hands have allowed her access to the diverse and glorious British Paraorchestra.